Shop — Louis Wohl & Sons, Inc. 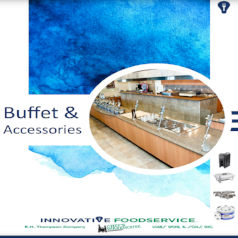 Innovative Foodservice offers everything the home and commercial chef needs, from kitchen equipment to supplies to design services. We aim to be the one-stop-shop for those who work with food in Florida. Take a look at what we have to offer you. With our multitude of products, we’re sure to have something to fit your needs — and even if we don’t, we’ll help you find it. Innovative Foodservice works with some of the best companies around to provide clients with excellent products. With our partnerships with these trusted companies, we can offer our customers the best kitchen equipment and supplies around. You’ll know you’re getting a good deal on a high-quality item when you choose from our inventory. We serve every type of chef, whether you’re a home hobbyist with a family to feed or a high-powered chef who needs the highest-quality products possible. Innovative Foodservice has something for everyone. Check out our vast catalog by clicking the “shop” button at the bottom of the page. You can browse categories to see what kinds of products we offer, or you can search for something specific. We offer thousands of products, so you have plenty of options to choose from. If you don’t see what you’re looking for, reach out to us, and we’ll help you find it. If you have a question for Innovative Foodservice, please get in touch with us. Use our online contact form, and a member of our team will get back to you as quickly as possible with the information you need. We look forward to hearing from you and providing you with the exact kitchen product that you’re looking for. Below are multiple catalogs that are here for you to look through and to give you ideas of what you may be wanting or needing. Take a look through them for some new ideas! Click HERE to view more specials.